Today is the end of February, so time for my second canvas print to go up on the ‘Canvas Prints’ page of the website. 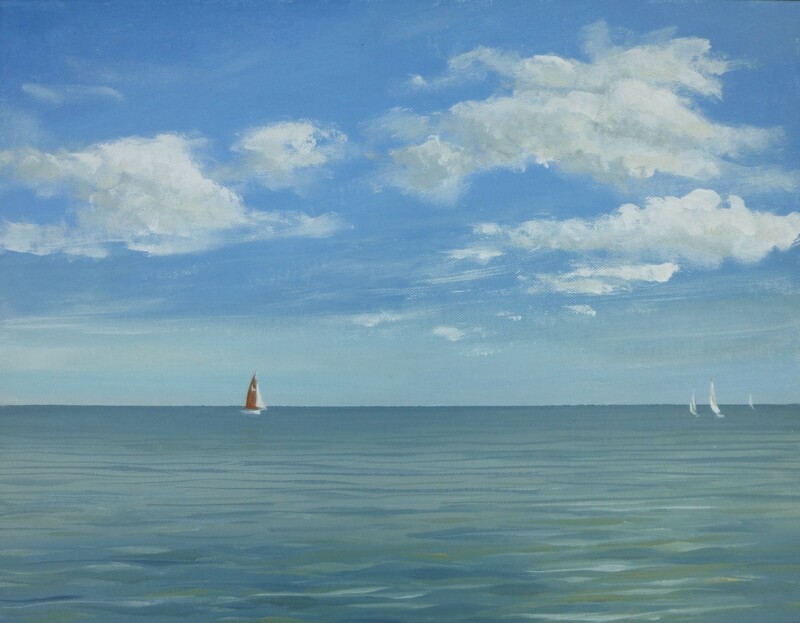 You may remember that this is one of my projects for the year – to launch a range of limited edition canvas prints of some of my most popular dinghy paintings, one a month. The one I have chosen for this month is ‘Dinghy on the edge’. This was a dinghy from West Mersea which I found on the little stretch of steeply shelving beach behind where all the big houseboats are moored. This painting was never exhibited, as only a week after I finished painting it just before Christmas 2013, it was purchased off the website for someone to give as a Christmas present. There are just six copies of this print available, which can be purchased for £25.00 and sent post free to any UK mainland address. All the details can be found on the Canvas Prints page of my website. Once they’re gone, they’re gone! Well, you’ve heard of baby-sitting, and house-sitting? Yesterday afternoon I was gallery sitting! Pru Green, owner of the new Sentinel Gallery in Wivenhoe left one of her young assistants and me in charge for the afternoon while she was out, to receive work being delivered by artists ahead of the Opening Exhibition. 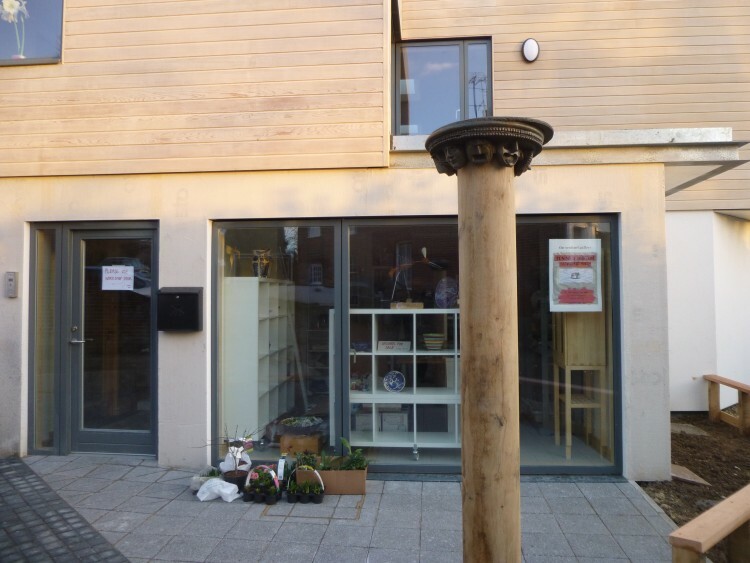 The gallery and the outside space is a lot more ‘finished’ than when I was last there. As I arrived, Pru and her builders were just considering the correct position of an intriguing piece of sculpture on a post outside the entrance. By the time I left it was all fixed – with lots of fascinating little faces looking out in all directions! I took the opportunity to deliver my four paintings that are going into the exhibition while I was down there. Lots of exciting work was coming in, and the exhibition promises to be very varied and interesting. This first show will be open Wednesdays – Sundays, 10.00am – 5.00pm, starting on Saturday 14th March and closing on Saturday 18th April. If you live in the Colchester area I really recommend going to have a look. 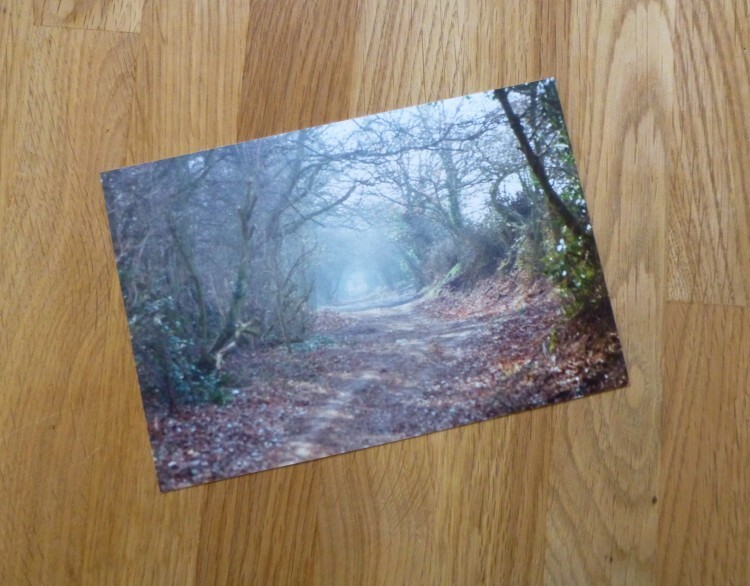 The photo was of the bridle path running from Stanway Green, where my parents used to live, across to the Maldon Road, and continuing on the other side down to the Roman River. When I was a teenager there was nothing but fields on either side, and we knew the path as ‘The Ramparts’. I believe archaeologists would more accurately describe it as ‘Grymes Dyke South’, for it is, in fact, one of the late Iron Age earthworks that were built to protect Colchester on it’s western and southern sides. I think there are three of these lines of earthworks, protecting the land that lies between the River Colne and the Roman River, and they each have a built up ‘rampart’ with a ditch on the outer side – the ditch being mostly filled in, and now forming the path. It is possible that this, the most outlying one, was slightly later but was certainly thought to be in existence by AD 10. Going ‘along the Ramparts’ at Stanway Green was a favourite walk of my Father’s, and he must have taken the photo long ago at just about this time of the year. I thought what a lovely painting it would make, with the very soft misty colouring, looking along the path into the sunshine. I loved the way the path seems to disappear into the light. I never normally paint just from a photograph – I like to have some drawing to fall back on at least – and this wasn’t even a photo that I had taken myself, but it was a photo of a place I used to know very well, so I thought I’d have a shot at it and see what happened. I’ve made a start, anyway! I may have to break off from this to get my ‘From my February garden’ painting done, though, as February seems to be slipping past rather speedily! . . . . . . .But actually I have been laid low by a nasty virus for the last few days, and haven’t been in my studio since last Tuesday 🙁 This photo was taken last weekend – and what is that on my easel? – all will be revealed in due course! 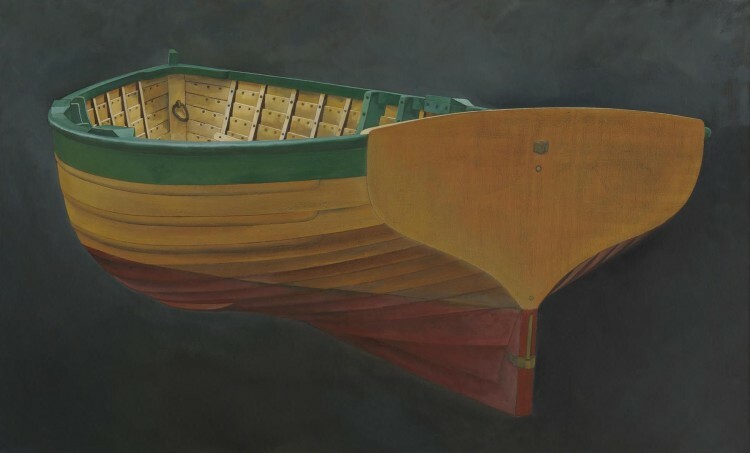 So, instead, as there has been no painting, I thought I would tell you about James Dodds’ upcoming exhibition at Messum’s Gallery in London’s Cork Street. Some of you lovely readers might remember that James Dodds was kind enough to exhibit some of his huge lino cut prints at the first Lexden Arts Festival back in 2012. It was thrilling to us to have such a ‘big’ name at that time, when we had no ‘track record’, and we were so grateful to him for giving us a bit more authenticity. 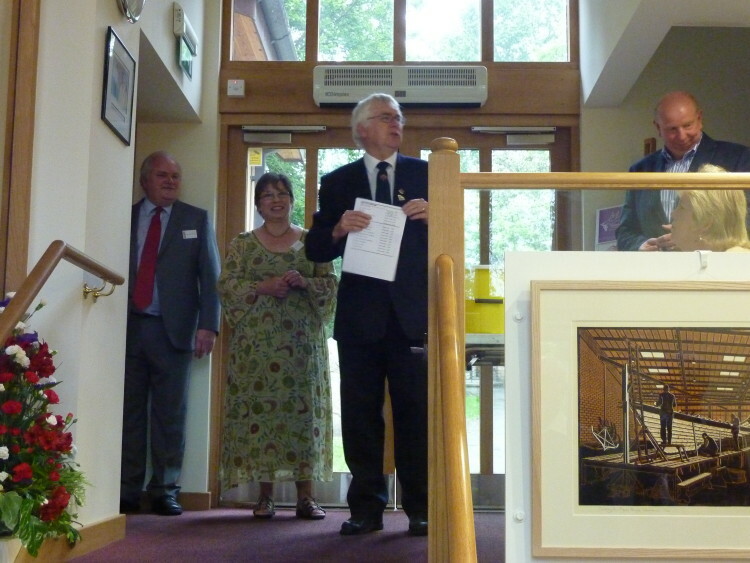 This photo of the opening of that first Festival shows (l to r), Graham, me, our Colchester MP Sir Bob Russell opening the Private View – and in the lower right corner you can see part of James Dodds’ print of the Royal Barge, Gloriana – for this was Diamond Jubilee weekend!! What an exciting time that was!! To come back to the present, though, James has an exhibition at Messum’s starting on 25th February, and running through to the 13th March. The show is, I think, all paintings and carvings, and looks as if it will be more than worth a trip to London. Here is his wonderful painting, from the show, of a winkle brig, which is a local boat from the Colne and Blackwater estuaries here in Essex. Messum’s is open from 10-6 Monday to Friday, and from 10-4 on Saturday. If you are interested in what is happening at this year’s Lexden Arts Festival, do check out our website, www.lexdenartfestival.org.uk which has listings of all the artists with links to their websites, and also all the events which are going on all the week. A new painting up on the website this afternoon – called ‘Afternoon Light, West Mersea’ – this is from drawings and photos from the Autumn, and is, of course, in the 2015 gallery. (I’m so pleased that my ‘Gallery’ pages are sorted out by time, now.) For those of you who know West Mersea, this view was looking out to sea from the Monkey Beach, between the ‘boat-y’ end near the floating pontoon, and the ‘hut-end’ where all the beach huts are. It was such a beautiful big sky, with different cloud forms, and the sinking sun just tinting the sea and lighting the lower clouds with a golden afternoon up-light. 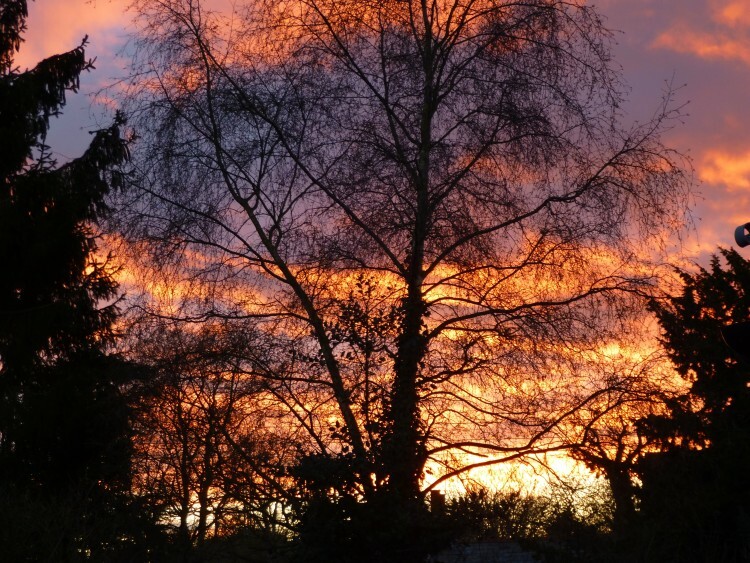 This is a wonderful time of the year for skies here in East Anglia, especially for spectacular frosty sunsets, and I photographed this one from my back door a couple of nights ago – I thought you might like to see it. I’m contacting all the exhibiting artists for the Lexden Arts Festival tomorrow, to start making appointments to visit them to discuss what they would like to show with us in May. 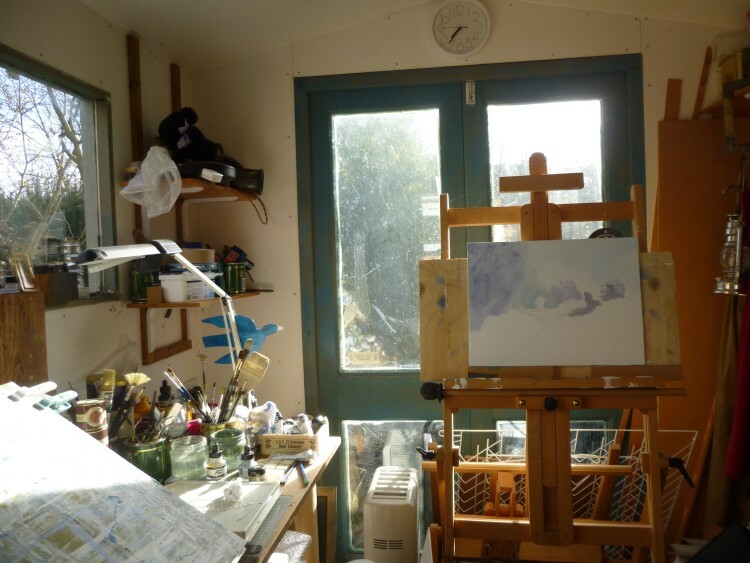 I love doing this – seeing other artists’ studios, and talking to them about their work is fascinating. This is the real start of the build up towards the festival!! – so exciting. Check out all the Festival events at www.lexdenartsfestival.org.uk and you’ll also see there a list of the artists that we have invited to show. I trundled down to Wivenhoe this afternoon with the back of the Land Rover full of paintings for Rosie and Pru to choose what they would like to exhibit at the opening exhibition at the Sentinel Gallery. It’s all go down there, with workmen out the front paving the entrance – at least I think that’s what they were doing – and the Gallery full of cardboard boxes, and two new jewellery cases which have arrived and are now standing ready to be filled with all sorts of lovely things, and Pru and Rosie getting everything organised. It’s going to be great! I was really pleased that they’ve chosen four paintings for the exhibition, which starts on 14th March, and runs through to 18th April. One dinghy, and three seascapes/’estuary’ scapes – Walton, West Mersea and Maldon. I’m busy at the moment with a seascape of West Mersea, but then I’ve got three Wivenhoe paintings that will be next up – two dinghies, and a river scene with lovely reflections – all from drawings and photos that I collected in the warmer weather. 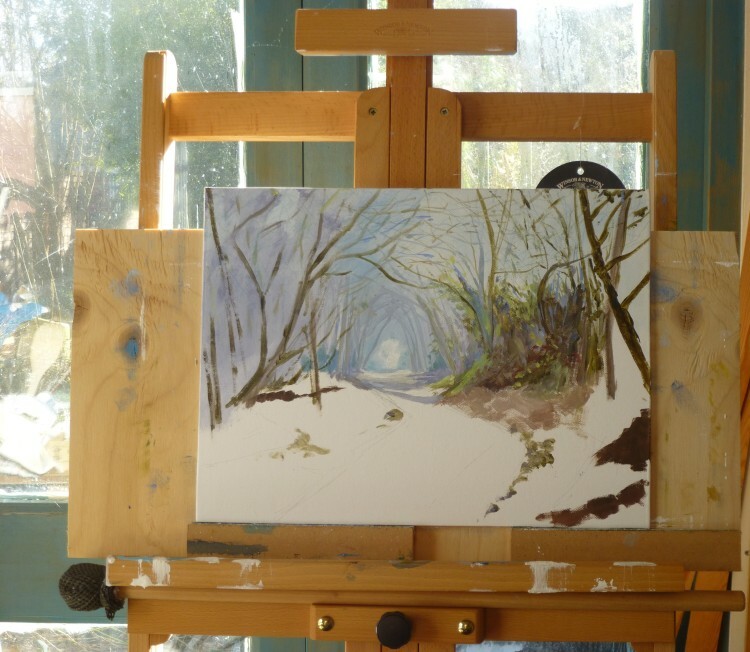 I’m still hoping for some proper ‘lying’ snow – I think it may be heading our way over the next two days – but at the same time it will be so lovely when it’s warm enough and light enough to go out drawing and getting new painting material in. To launch a series of limited edition canvas prints was one of my goals for the year, but I wasn’t expecting to get it up and running quite so soon! 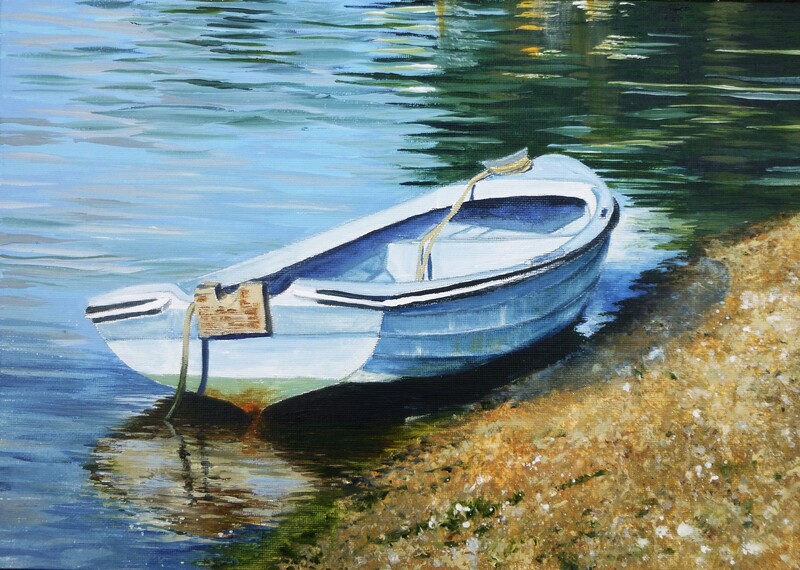 Ever since I started the dinghy paintings in 2012 they have been really popular, and most have sold almost as soon as they are finished. But there have been some which have been really popular which I could have sold over and over again. I thought this new venture might be a way of letting more people have a copy of their favourite ones. I am limiting each edition to just 6 copies, though, so that they are still rather special and exclusive – so if you want one you need to be quick off the mark! Each print is named on the back, along with it’s edition number (e.g. 1/6, 2/6, etc.) and also signed by me. The canvas is wrapped onto a strong wooden frame, 1.8cm deep, and I think the printing is very good with accurate colours which well represent the original painting. The plan is now to have a new print available on the website on the last day of each month, throughout this year – and the first one is . 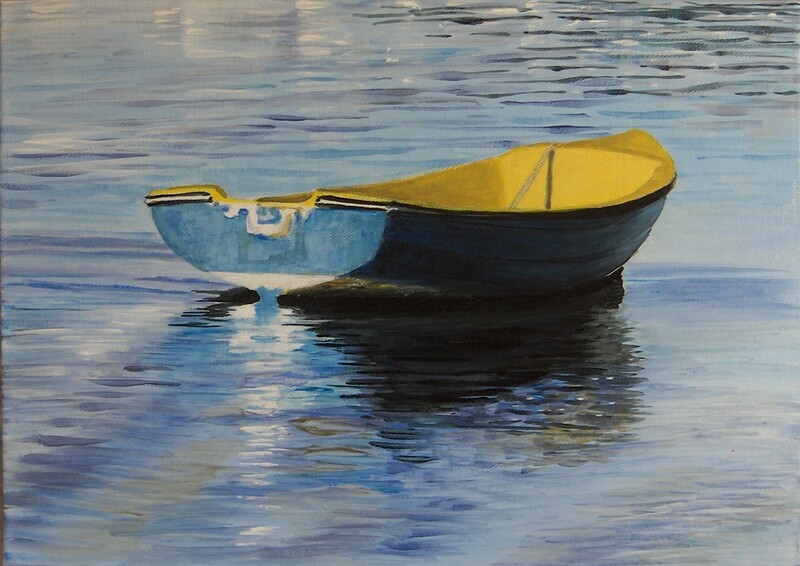 . . BLUE DINGHY! All the details are on the new CANVAS PRINTS page accessible from the menu bar. The price of £30.00 includes packing and postage to any mainland U.K. address. If you are local to the Colchester area, though, and would rather deal direct instead of using PayPal, then do contact me using the email address which you can find on the contact page. Then watch out at the end of February for dinghy number two! PS Someone asked me yesterday about comments – if you would like to leave a comment about anything, click on the blue title to the right of your screen for the post on which you wish to comment, and a comments box will open up below the post. I’m always delighted to hear from you!